The paper has been devoted to annealing of massive rolls with working layer of high alloyed cast iron. It has been showed that such treatment rise homogeneity of properties distribution (hardness, coercive force) along working surface of rolls and insignificantly reduce it level. Key words: Annealing, coercive force, homogeneity of properties, hardness, roll, working layer. The analysis of the processes occurring during heating of the casting nonstick paints based distensilimanita silicate and sodium aluminate as a binder. It is found that the use of sodium aluminate contributes to the strength of paint throughout the range of temperatures studied. It is given explaining processes taking place in the colors in the process of aging, drying and subsequent heating. Key words: Sodium silicate, sodium aluminate, paint casting antipenetration. Shown is the doubtless ecological advantage of vegetable oils over synthetic resins. Information on the possibility of a complex effect by modifying oil with salts and hot air blowing ensuring core hardening within 4 to 6 minutes is given. Proposed is a method of determining the maximum thickness of a sunflower-seed oil bound core hardened by hot air blowing. Key words: Gas permeability, porosity, specific surface, fore-riser rings, core thickness, heat exchange, salts, air volume, sand volume. The article describes defects in the form of oxidized blowholes in such castings as cylinder block, cylinder head and cylinder cover for internal combustion engine parts. Ways of eliminating them are shown. Key words: Technology, defects, the systems, the oxidised bowls, ventilation, nonmetallic inclusions, a thickening of walls, casting, quality, marriage decrease, increase, оksid coverings, steady indicators. In this paper considered the tecnolodgy manufacturing of yttrium oxide high-refractory ceramic molds and cores with using environmentally friendly binder. Investigated structural and phase transformations in sol Y2O3. Shows main properties of ceramic molds: linear shrinkage, open porosity, the surface roughness, strength at room temperature and 1600 ?С. Presented the results of casting uncooled blades by high-gradient directional solidification from LMS. Key words: High-refractory ceramic molds, sol Y2O3, directional solidification. The article discusses the process of expanded pattern casting in flasks with lateral and bottom air removal. A change in the flask design by using a corrugated metal hose for air intake made it possible to solve the problem of clogging the air ducts. Key words: Flask, pattern, casting, metal hose, quality. In work the main heatphysical and rheological characteristics of synthetic pitches of the domestic and foreign production applied as the strengthening component at manufacturing of model compositions to investment casting of blades and other details of GTD are considered. It is shown that the lowered values of softening temperature significantly influence heatstability of model composition that negatively affects the main characteristic of the model composition defining stability of the geometrical sizes of the wax patterns and their durability. By results of the carried-out researches of the main heatphysical and viscous characteristics of different brands of hydrocarbonic pitches the best characteristics have shown hydrocarbonicalifatichesky pitches of the UCRP- 100L brands and C5-100. Key words: Investment casting, gas-turbine engine blade, model compositions, synthetic pitches. The article describes the experience of KASI foundry on creation of effective pig-iron castings production, including modern manhole cover castings. Aspects of technology, advantage of casting production using the most advanced molding Seiatsu equipment (green sand) as well as automated molding lines for flask and flaskless molds (incl. round) are described. 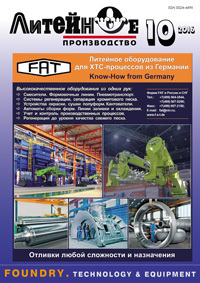 Key words: Import substitution of castings, modernization, innovations, effective foundry production, flask and flaskless molding lines, Seiatsu-process. The article presents an alternative method of recycling the dispersed metal wastes (shavings, dross, sludge, etc.) – recycling in the rotary tilting furnace (RTF) to produce pig iron or fine iron-containing alloys. Describes the advantages and prospects of processing of metal wastes from own production with the use of RTF in foundries of machine-building enterprises. Key words: Rotary tilting furnace (RTF), recycling, dispersed metal wastes, reductive melting, the duplex process.